If 1 ship can so easily keep you out if the top 20, maybe you need to look at how you are developing in the game, and maybe ask for help. Doing that before claiming the "new thing" is broken would probably be more helpful. Unless the new thing is so OP that not having it prevents you from getting in the top 20. 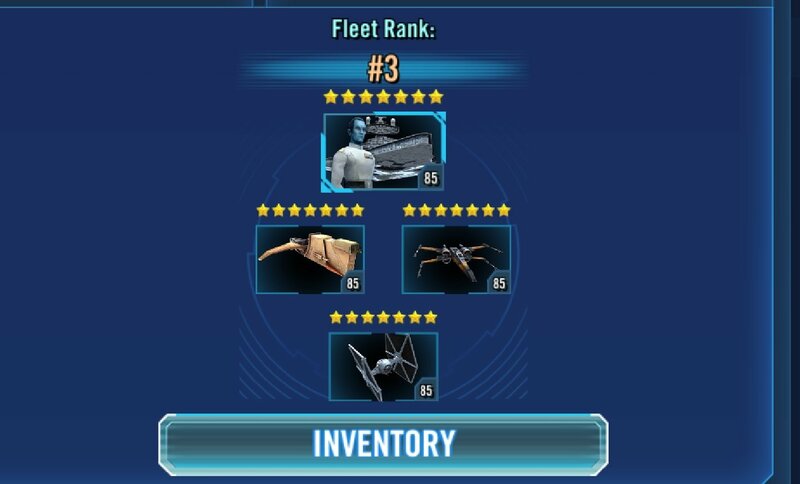 Most of my fleet is well developed, but one guy with this ship maxed out prevents me from no1 spot. Various combinations against it and all get flattened. So, please, how do I beat it without having it? It’s OP, even more so that HT was. Alongside each other it’s near unbeatable. I know most of the top 20 fleet players and roughly know their payout times. No one has taken no1 spot today. I doubt anyone will for quite some time to come. Top 20 is different than 1st. It's not unbeatable, you just dont have a team developed to do so, there is a difference. Here are some examples from my shard. These 3 were not in the top 20 when I went to bed. It is possible, and people are doing it. If someone has been able to develop a team you cant beat, dont they deserve 1st? Developing a team, sure. Deploying the latest OP item, no. It’s not just me, it’s everyone. I haven’t seen the one other guy with **** Falcon yet as his payout is in the early morning, about 8 hours from now. Chances are no1 spot will just end up being shared by those two. 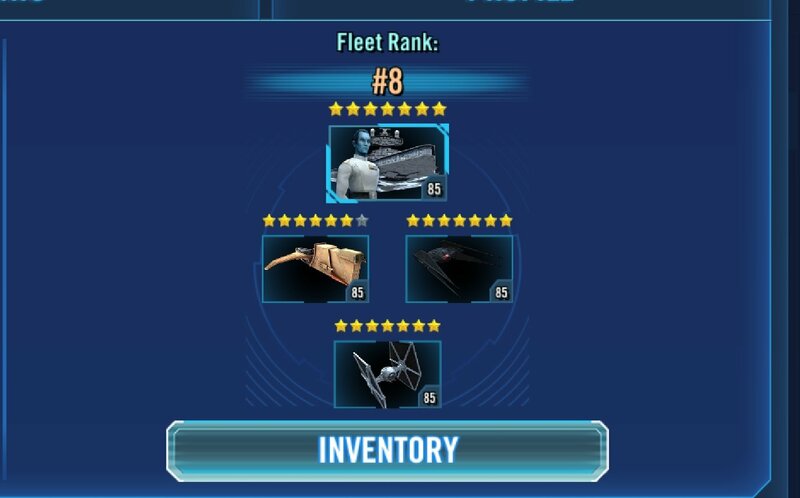 Not through ‘developing a fleet’ but by having the latest OP maxed out item. Unless you mean ‘d$v$loping a fleet’, in which case sure. 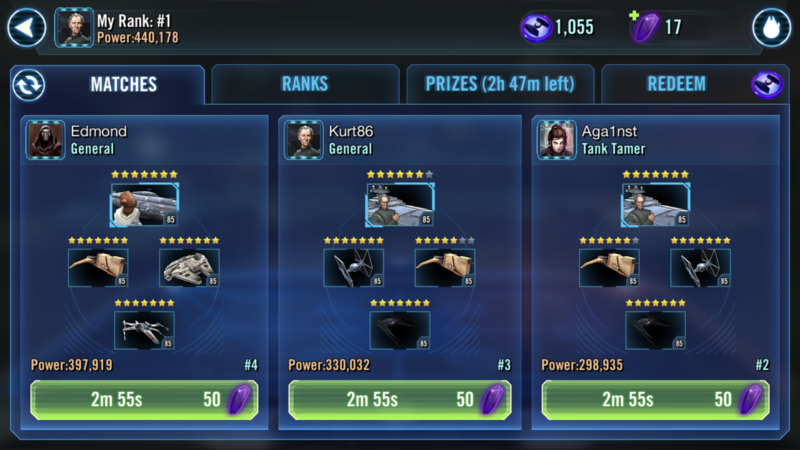 It’s nice of CG to mess up ships as badly as they have the main arena, just a shame they couldn’t leave ships alone. Edit: apparently you can’t write em ef even though it’s the abbreviation of the ship. High five CG! Oh I didnt realize they got HMF without developing other ships. And that they have a fleet just sitting there with just HMF as the only ship. Most likely they have several ships developed for both the purposes of getting HMF and to use with the ship. This required them to make choice and follow a plan that they saw as a good idea. Yes people spend $$, it doesnt get them anything someone cant get for free. It just gets them there faster. F2p have and will get HMF this go around, most of the requirements were around for a while and squeezing out the last ship can be done without too much of an investment of crystals, which can be gained for free. Yep. It's the only solution. Better go ahead and get it over with. Huh, i’m getting falcon 7* for free. Not there yet, but about 20+ shards to go on both IG and XB. About the same to go for my alt, just that it’ll only hit 6* but it’s fine in that shard. TBH it’s one frigging legendary ship that requires a raid toon and a legendary toon to pilot. It’s not something u can just get for $$$$$. Do tell. Woke up this morning with my top 10 all Akbar/Falcon. But also noticed one guy starting with Poe in his lineup. So 2 ships faster than HT and hope to Insta-gib the ghost? Been here over 3 years and the constant complaints about stuff being too hard to beat is so played out now. It’s almost like people don’t remember the past. Of course stuff may be hard to beat when it firsts goes live. After a few days to a week later, people find strategies. Then it becomes easier to beat. Enough with the complaints already. If you can’t beat something then you obviously are doing something wrong or need to give more attention to the pilots and ship abilities and synergies. Maybe you need to polish your pilots up by getting them G12 and adding g12.5 gear. Do something about it other than complain. It just makes you come off as entitled like you deserve to be at a higher rank than what you can currently get because the newest ship has been added. I used to be on these forums a lot....due to the complaint after complaint and post after post...I just figured I’d rather stay away cause seeing the same ‘o thing when something is released is pretty annoying. Pretty safe to say the new falcon just broke the game. How many newly-introduced characters have I heard were supposed to do this? And none of them have. I dunno - Revan came pretty close. Both ht and jkr did. HT hasn't broken anything - just like Nest hasn't. Well, it may have broken the minds of people who think one team should rule all, but it certainly didn't break the game. And yet you slackers have still not told me how to beat it! I'm feeling lazy today. Someone do the hard part for me. No, neither broke the game per se - but both are poor kit design. Logically, getting "stronger" by being hit repeatedly, even whilst stunned, makes no sense (unless you are the Hulk). Nest is the far worse offender of the two though (and yes, I have a g12+ Nest - so no, I'm not complaining about a character I can't beat or don't have). But whatever. CG made it clear 17 months ago that they don't give a rip about player experience and prefer to look at bottom line and income as their only guiding principles. Looks like they have learned well from their "parent" company. All you have to do is look at the fact that 98% of the people that have HT run HT - that tells you all you need to know. I love how "Ships 2.0 created diversity". lol - yeah, no it didn't. It just forced a different meta...that virtually anyone who can, runs. Dont worry in a month there will be counters like always! Yeah. Honestly. It's insanely good. Drop the cleanse and it's still the best ship in the game by a mile PARSEC. I start Tooth, Spy, Soldier, with Sun Fac, Biggs, Asohka, and Poe as reinforcements. I beat a couple Falcons yesterday (all 5*, as I’m in the top 50, not top 20 any more since I’m farming Bounty Hunters freeplay, without refreshes) with that. Have to use Tooth’s special judiciously to ensure taunt is up while Spy and Soldier are unstealthed, then Sun Fac first to ensure you always have a taunter. Save the mass assist for when Sun Fac is out and beat up everyone as soon as they come in—if Falcon doesn’t have the buff you hit it if you can kill it, but otherwise I was focusing on his supports. Second reinforcement depends on the situation. If Ghost is out I had A HOOT bringing Asohka in and giving her a ton of health by dispelling all those yummy buffs. Poe is a good call if there’s someone wothout protection or if you just need a big shot. Biggs is his usual all-star self. Absolutely. All the Falcon does is make the HT less effective on defense. Fleet arena is headed the same direction as squad arena...nothing is going to hold on defense. Nothing in my roster can beat him. Has anyone found any lineups that can beat Falcon that don't require having the Falcon? The only way to shut down the massive number of assists would be to daze with Resistance X-wing or Poe, but X-wing is really slow and Poe requires a TL to have a chance at land a daze, which is easier said than done when any debuffs you apply are getting dispelled constantly. I have a maxed cassian, hasnt done anything for me against the power trio. I fought 3 falcons tonight and Cassian won it each time. Wipe buffs and call your biggest hitter (mine is Vader) to assist on HT or hopefully Falcon. Cassian can also cleanse Breach from your tank to defang the Tooth. And its early but honestly I think Biggs and Sun Fac (and perhaps Clone Sarge) are far better tanks against Falcon because of her dispel on Basic and she can cleanse his breach. Biggs + Vader constantly refreshes his taunt and heals his protection, which HT cannot do. Clone sarge always gains taunt with protection and SF gets it against Buffed enemies. Falcon will almost always be buffed. In short, the Falcon is the death of HT. Mace fleets with non-HT tanks should do great against it. I've beaten several Falcons now without using mine, including a 7*. Same lineup I always use: Silencer, HT, FO Tie, with Vader, Biggs, Slave1, and Kylo's Shuttle as reinforcements. 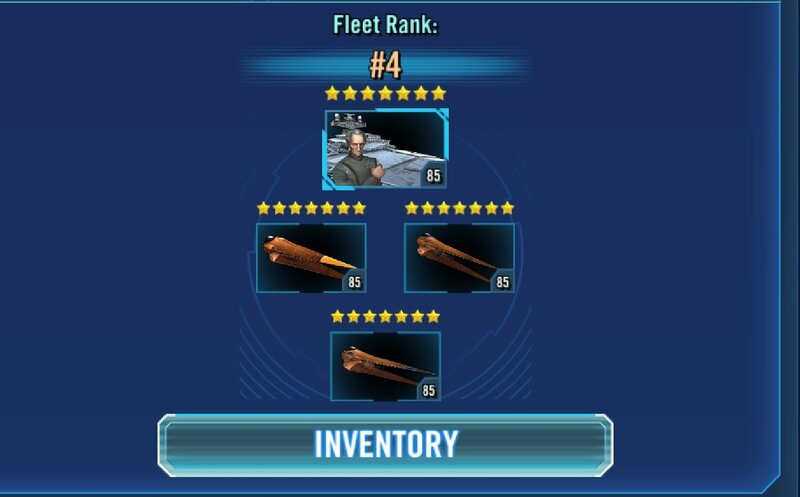 I will concede that I haven't yet seen a 7* HanFalcon with a full Rebel fleet setup yet, and based on what I've seen that does seem like it'd be pretty brutal. It’s a great ship. I have at it at 5* and it’s awesome. However; it does not seem Revan caliber to me. Also I’ve won against others with even 7* just fine. I see you said this in the other post too, but I can assure you that you are doing it wrong if this is the case. HMF is easy to take down if you can hit him. Cassian in the right moment opens that up for you. On the subject of Clone Sgt, don't forget that his special can't be dodged, so if you can target Falcon it's not going to be dodging. A little less important than the taunt, of course, but his special is highly under-rated! You still have 5 days. Can easily get 5* in that time. I took IG2000 4* - 5* in 2 days (no $ spent).